The Aquarium Gallery and Studios hosted The Art Nunz. The art opening took place february 14th, 2015. This past Valentines Day more than pre-Mardi Gras celebration was happening in New Orleans. 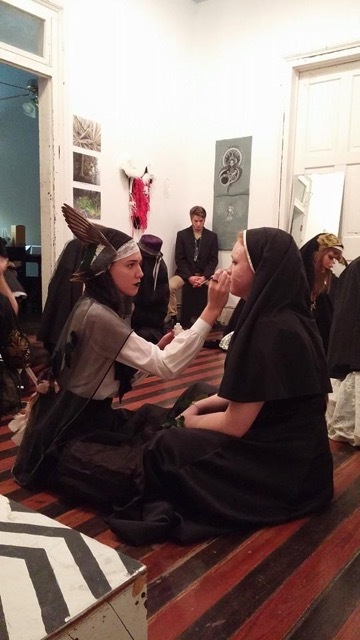 The Art Nunz, a visual and performance group, was chanting and singing before ritually burning their drawings, paintings, and photographs at Aquarium Gallery. The Art Nunz describe their performance like this: DEEP UTERINE MYSTERY. Q: What should people expect when they come to the show? A: EVERY TIME WE HAVE AN ART OPENING WE RENEW OUR VOWS TO OUR ART. In this way…this is a marriage. It is also a sacrifice. WE are using performance as a way to discover what we did not know about ourselves and finding meaning in the remnants of disparate cultures. Q: Are you inspired by any artists or works of art? A: Our influences include: Joseph Beuys…and loosely based on Buddhist tantra painting, Catholicism, pagan ceremonies, Mardi Gras Indians. We strive to hit highs and lows…and humor when possible. This is not a parody, it started off as a joke and turned ridiculously serious. Monique Boileau and Ellen Holbert paint each others faces in preparation for the performance. Q: What do you want people to walk away with after seeing your show? A: Every god or goddess was invented in the minds of man. Every religion started with the worship of this deity. We are giving ourselves permission to work with ritual as a medium for discovery. The art nuns are passionate about making things up. If we knew what we were doing…it would cease to be a mystery. 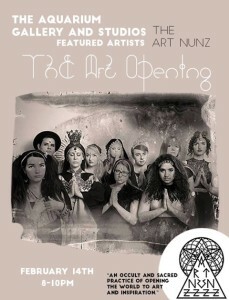 Art Nunz consists of 24 members, most of which are currently students from FSU. Those who participated in “The Art Opening” include: Cassie Luger, Amanda Boekhout, Morgan Bryson, Lindsey Monteiro, Ellen Holbert, Cassidy Routh, Jordan Aman, Stella Guillen, Michele Magaro, Alicia Smith, Monique Boileau, Carrie Ann Baade, with musical support from Jack Cavanaugh.